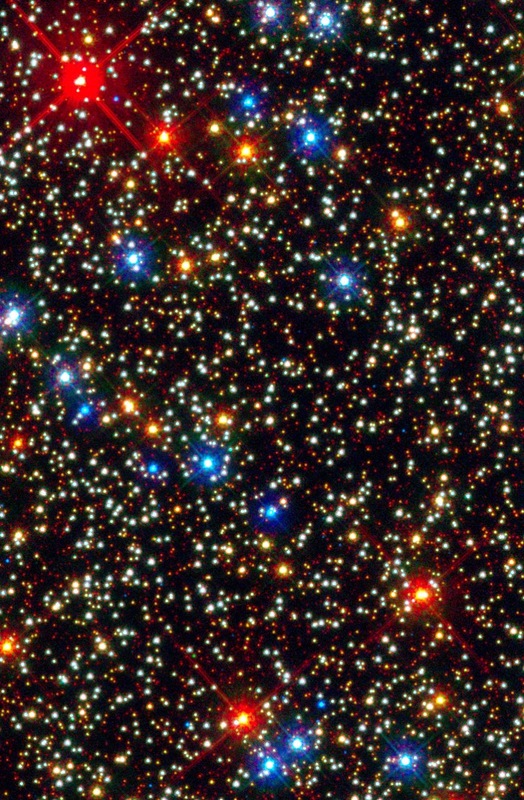 A precise measurement of star motions in giant clusters can yield insights into how stellar groupings formed in the early universe, and whether an "intermediate mass" black hole, one roughly 10,000 times as massive as our Sun, might be lurking among the stars.Analyzing archived images taken over a four-year period by Hubble's Advanced Camera for Surveys, astronomers have made the most accurate measurements yet of the motions of more than 100,000 cluster inhabitants, the largest survey to date to study the movement of stars in any cluster. "It takes high-speed, sophisticated computer programs to measure the tiny shifts in the positions of the stars that occur in only four years' time," says astronomer Jay Anderson of the Space Telescope Science Institute in Baltimore, Md., who conducted the study with fellow Institute astronomer Roeland van der Marel. "Ultimately, though, it is Hubble's razor-sharp vision that is the key to our ability to measure stellar motions in this cluster." Adds van der Marel: "With Hubble, you can wait three or four years and detect the motions of the stars more accurately than if you had waited 50 years on a ground-based telescope."